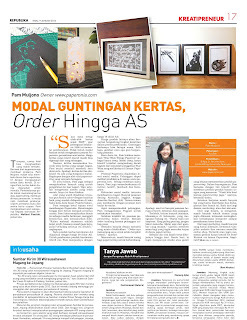 I'm proud and yet humbled at the same time to share to you that Paperonia was featured on Kreatipreneur (creative entrepreneur) section of a national newspaper on January 9, 2013. This was my first press coverage and there's no doubt I was so excited about this. It's such a blessing and a very good start in 2013 to keep me motivated to continue creating. I hope this story will affect and inspire at least a few to give paper-cutting a try. 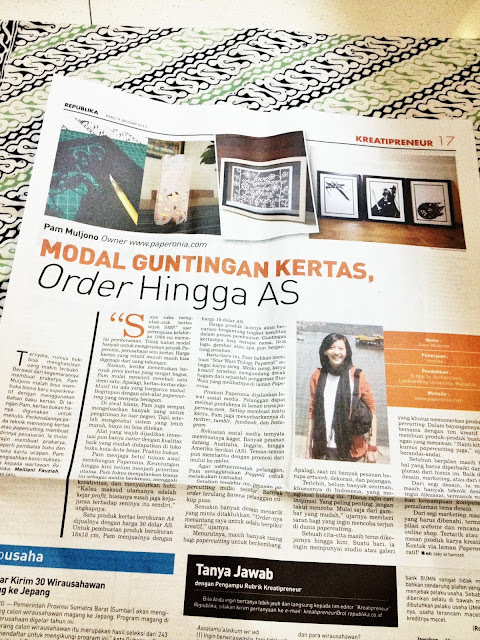 Many thanks to Farah Mauludynna for the support and help in spreading the words about Paperonia and Sarah Siregar for writing this article. Click on the image below to enlarge and read the article (in Bahasa Indonesia).